Known as the Cliff Benson Beltline, Interstate 440 forms the northern two thirds of the 25.2-mile long Raleigh beltway. The 1960s-built freeway winds northeast from I-40 near Lake Jackson to North Carolina State University and U.S. 70 by Crabtree Valley Mall. U.S. 1 accompanies the route east to Exit 11, as I-440 turns back south. The freeway meets Interstate 495 west of Knightdale, where U.S. 64 combines with the beltline south back to I-40. AASHTO approved the numbering of Interstate 40 from an application by the state of North Carolina on June 9, 1991. Interstate 440 replaced Business Loop I-40 along the Cliff Benson Beltline, which was officially decommissioned by AASHTO at the same time. When Interstate 440 was first signed, it used cardinal directions based upon the direction of travel. So along the portion through the east side of Raleigh, I-440 used north/south banners, while the stretch to the north used east/west signage.1 The signing of I-440 was later changed to use an inner and outer orientation, similar to those found on the I-277 inner belt freeway around Downtown Charlotte and the I-485 beltway around Mecklenburg County. One of the former inner/outer trailblazers posted along Interstate 440. These were mostly removed by 2009 with I-440 resigned as an east-west route. Photo taken 07/12/05. Plans announced in August of 2003 removed the I-440 designation from the concurrency with I-40 along the southern third of the Raleigh belt line while restoring cardinal (east-west) direction banners along the remainder of the route. The renumbering was reinforced by local references to the I-440 segment as the “Beltline” and the I-40/440 portion as simply “I-40”.2 According to Brian LeBlanc’s former Wake County Roads web site, sign changes were made by 2009. The initial potion of the Cliff Benson Beltline opened in 1960 as an extension of the U.S. 1 freeway from Chatham and southwest Wake Counties to end at Hillsborough Street. The route was extended another eight miles to Capitol Boulevard in 1963. 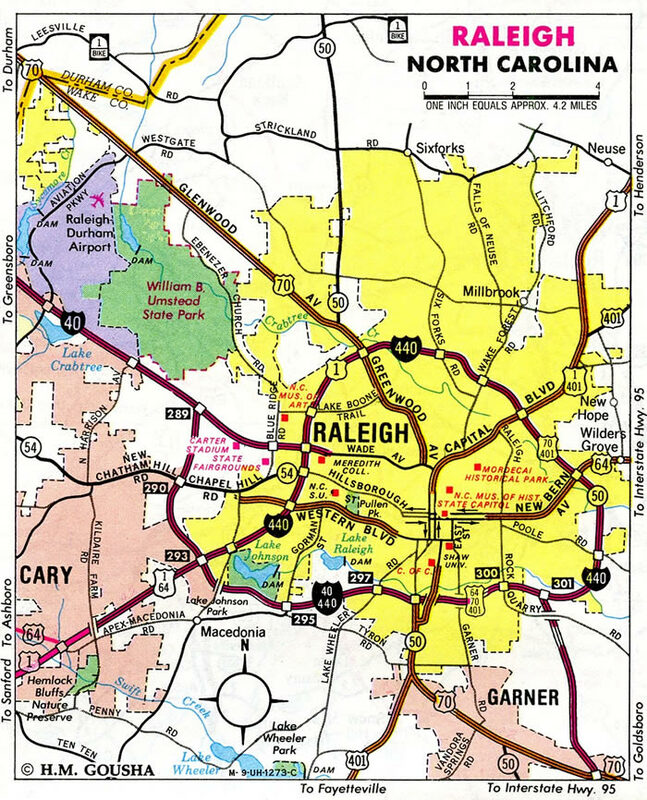 The 1993 Gousha North Carolina Map was updated to show the new Interstate designation for the Cliff Benson Beltline. The I-40/440 concurrency was one of 2-digit Interstates overlapped with a branch route. Other entries include I-95/495 around Washington, DC, I-87/287 across the Hudson River in New York, I-94/694 in the Twin Cities, MN and I-80/580 at Berkeley, CA. One mile south of the three-wye interchange (Exit 301) with Interstate 440 east and U.S. 64 on I-40 west. 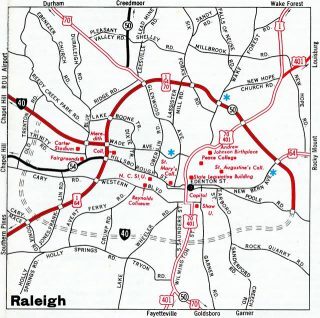 U.S. 64 joins the city of Raleigh with Interstate 95, Rocky Mount and the Outer Banks of North Carolina. The portion leading east from I-440 to I-540 doubles as Interstate 495. Photo taken 05/30/07. A lane drop occurs in one half mile at Exit 301 as I-40 turns west with two lanes to merge with U.S. 64 across the south side of Raleigh. Downtown Durham is 30 miles to the northwest of this junction. Photo taken 05/30/07. A diagrammatic sign outlined the Interstate 40 entrance onto the Raleigh belt line. The sign is still in place, but without the I-440 trailblazers. Photo taken 05/30/07. Interstate 440 west combines with U.S. 64 east to Interstate 495. I-440 turns northwest from there to combine with U.S. 1 to the south of Wake Forest. These signs were changed to remove I-440 inner for I-40 west and change I-440 outer to west. Photo taken 05/30/07. Interstates 40 & 440 west passed under Avent Ferry Road on the one mile approach to Exit 293 with U.S. 1. A lane drop defaulted motorists onto the Cliff Benson Beltline east. U.S. 64 splits with the Tom Bradshaw Freeway to accompany the U.S. 1 freeway southwest to Apex. Photo taken by Chris Patriarca (06/13/03). A collector distributor roadway (Exit 293) takes motorists to I-440 east & U.S. 1 north back to Raleigh and Wake Forest. This interchange would have doubled as the northern terminus of Interstate 140 had AASHTD approved the designation for the U.S. 1 freeway between Raleigh and Sanford. Photo taken by Chris Patriarca (06/13/03). A view of the Exit 293B departure of Interstate 440 inner & U.S. 1 north from the Interstate 40 westbound mainline. The two routes overlap with one another until U.S. 1 departs the beltline via Exit 11. Photo taken by Chris Patriarca (06/13/03). This diagrammatic sign shows ramp connections from Interstate 440 and U.S. 1 south to I-40 (Tom Bradshaw Freeway). A full cloverleaf interchange (Exits 1B/A) joins the two freeways. Photo taken 07/12/05. This guide sign was replaced by 2007. It referenced the U.S. 64 relocation from the Beltline back to I-40. The substandard nature of I-440 remains in place today with U.S. 1 transitioning onto its own freeway along side U.S. 64 toward Sanford and Pinehurst in one mile. Photo taken 07/12/05. Continuing south from the parclo interchange (Exit 1C) with Jones Franklin Road, I-440 west & U.S. 1 south expanded to three lanes for the upcoming c/d roadway (Exit 1) with Interstate 40 and U.S. 64 east. Photo taken 07/12/05. A trailblazer for Interstate 440 / Outer Beltline was posted prior to the c/d roadway for Interstate 40. Photo taken 07/12/05. Interstate 440 south and U.S. 1 south split at this point. The left two lanes follow U.S. 1 south and U.S. 64 west toward Apex, Sanford and Asheboro. The I-440 mainline utilized a loop ramp to join I-40 east across the south side of Raleigh. Photo taken 07/12/05. Exit 293A connects Interstate 40 east with U.S. 1 south and U.S. 64 west to Apex, Sanford and Pittsboro. A loop ramp (Exit 293B) follows onto Interstate 440 east & U.S. 1 north. Wake Forest is the control city for the continuation of U.S. 1 beyond the Beltline. Photo taken 05/30/07. Wade Avenue provides a direct route from Interstate 40 east to Interstate 440 & U.S. 1 (Cliff Benson Beltline) from Exit 289. I-40 otherwise meets the Beltline directly at Exit 293. This ground level guide, the first for the west junction with I-440, was replaced after 2009 when the freeway was expanded to six overall lanes. Photo taken 05/30/07. Approaching the collector distributor roadway (Exit 293) with Interstate 440 and U.S. 1-64 on I-40 east. Inner and outer direction banners were used along I-440 until 2007. Photo taken by Chris Curley (10/00). Greenouts applied to the Exit 293 departure by 2007 acknowledged the removal of I-440 from the overlap with I-40 and the relocation of U.S. 64 to run east with I-40 to I-440 and the Knightdale Bypass (I-495). This sign bridge was replaced by 2011 during widening of Interstate 440. The c/d roadway now departs further west from the Buck Jones Road overpass. Photo taken 05/30/07. Just beyond the gore point from I-40 east, an Interstate 440 inner beltline trailblazer was posted along side the freeway. Photo taken 05/30/07. Exit 293B looped away from the c/d roadway of I-40 east to I-440 inner (east) & U.S. 1 north. U.S. 64 was still referenced as well. Vidcap taken 02/14/01. Rhodes, S.D. 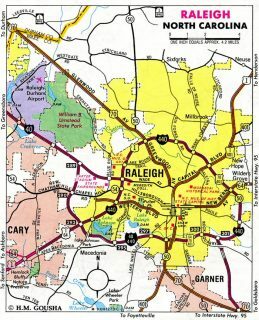 “Raleigh Beltline to change signage yet again…” Online posting, Yahoo Groups – Southeast Roads and Transport, Aug. 30, 2002. Page updated February 10, 2016.